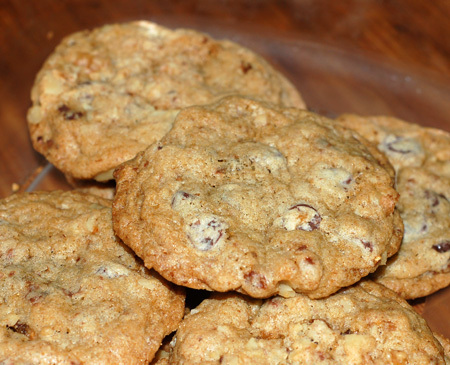 This is our favorite chocolate chip cookie recipe. The lower temperature makes cookies that hit that perfect balance between chewy inside and crisp exterior. They are definitely better with toasted nuts, but if you can’t be bothered, untoasted nuts work fine too. The toffee bits, my personal touch, add a subtle flavor that enhances the overall cookie experience without asserting itself. We made these most recently for Christmas at my parents’ house, and used Ghirardelli bittersweet chocolate chips, untoasted walnuts, and crushed toffee bars. They didn’t last long! Adjust the oven rack to the top 1/3 of the oven and preheat to 300F. Line baking sheets with parchment paper. Beat the sugars and butters together until smooth. Mix in the egg, vanilla, and baking soda. Stir together the flour and salt, then mix them into the batter. Mix in the chocolate chips, nuts, and toffee bits. Scoop the cookie dough into 2-tablespoon balls (a cookie scoop works great) and place, spaced 4 inches apart, on the baking sheets. Bake for 18 minutes, or until pale golden brown. Remove from the oven and cool on a wire rack. Store at room temperature in an airtight container for up to 3 days. Make about 20 cookies.